Today is the day we finally were able to order a new oven! 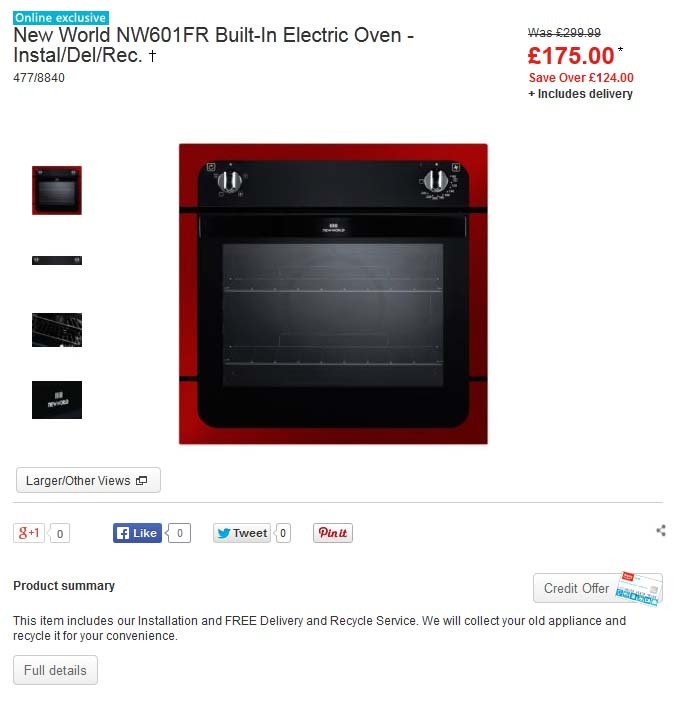 For a few years now, every few months we have debated whether to buy a new oven or not… as we really do need one. Every time we undertook this discussion we ended up thinking “oh, maybe sometime in the near future we will have enough money to do the entire kitchen all together…” and that was the end of it… end of the discussion and thus the old oven stayed in place and struggled on, every time Mark is cooking or baking I have to listen to him moaning about it, he does it under his breath but I hear him. But something happened… a few days ago my lovely parents called and told me that they are going to buy us a new oven as it looks like we are not able to make this decision. At first we went straight back to our usual chain of thoughts… “nah, this will do until we can get something we really want”, but my dad wasn’t happy with this train of thinking and he wouldn’t accept it, so… here we go – we are getting a new oven. All monies have now been paid and so we are in the awful waiting stage. It should be arriving on our door step within the next 21 days! The kitchen is not my favourite place in the house but I am so happy! No more leaking oven and undercooked bakes because it didn’t keep the temperature as it should. I can almost visual all the lovely food we will create in it once it is here… there will be totally no excuse for not baking no more! It is good to wait for things sometimes and hope and dream… but like my dad said “sometimes you just have to take what life gives you”… at this point, in our case we are getting a new oven! Buying your first home together – are you ready? < Previous Our Little Stealer! I so need a new oven – our current one is so unreliable! This one looks great with the red surround and very affordable. We need a new oven but will wait until the current one dies, don’t think it’ll last too much longer!! Snap! My mum is buying me a new en to replace the 20 year old oven. It’s so hard agonising over these things, whether to wait it out or just make the change now. I hope you are happy when it arrives, the red looks fantastic! So exciting to get a new oven. I bet you’ll be cooking up a storm now. Looking forward to hearing more about it. Hurrah! I hate having to buy expensive but necessary things, so glad your dad made the decision for you! How exciting, I’m sure you’ll love it! We need a new oven too. Ours is gas and it’s not igniting properly. Oven shopping is not fun though! hope you love your new oven and start enjoying cooking a bit more. Excellent – I look forward to some posts to celebrate your baking now! time to bake some delicious cake with your new oven! Awwwh I need a new kitchen as well. I am so grateful for when I get help. I so know how you feel. We need a new kitchen but can’t afford it. Our oven would helpfiully switch itself off half way through cooking. But we had the same situation, my parents bought us a new oven too. They wanted to be able to cook something while dogsitting lol. I am very jealous and desperate for a new oven as the outer glass keeps falling out of the door of mine. Happy baking!